Um.... I believe this is an image of the North Rose It... doesn't look good. And that's before the spire collapsed, several more hours of fire can not have done it any good. Sadly, construction & renovation often raises the risk of fire in old buildings. Old wood dries out and is easily combustible. Notre Dame was a beautiful building and will be again. It may take a lot of money & years of construction, but I think it will be rebuilt. Last edited by aceplace57; 04-15-2019 at 07:14 PM. Last edited by Springtime for Spacers; 04-15-2019 at 07:18 PM. “On the street, on the ground, no debris of stained glass. Just old broken stones... ‘We stay worried,’ whispers a fireman,” he tweeted. France typically uses large aerial firefighting aircraft, particularly the Canadair CL-415, to fight wildfires. Even if they were available nearby for deployment, such aircraft are in general not suited to fighting structure fires. A full load of water from a CL-415 weighs over 6 metric tonnes; that much water falling at once on the cathedral would be destructive of anything standing, including the centuries-old masonry structures. I'm not sure what would happen when that much water started flashing to steam on contact with the heat inside the building, either. Also importantly, it's difficult to be precise in releasing that water -- it's meant to fight a forest fire, not a single building. The water drop would pose a danger to people, equipment, and structures near the cathedral. Finally, the smoke and increasing darkness would make it difficult to operate the aircraft over the site. At no time did they have control of the fire. At best the fire fighters kept the airborne ash content down somewhat. Thought there was a fire at Notre Dame University. Last edited by madmonk28; 04-15-2019 at 07:44 PM. Didn't somebody do a 3D laser scan of the interior, at one point? As to the weight of the water that would be a function of the dispersal pattern and that's computer controlled. It's not 1950. Having toured the production factory of these aircraft, been shown the function of the water collection and release systems, and observed their airborne operation, I can say with confidence that they are neither computer-controlled, nor able to release water in precise, fine amounts. The water release is directly controlled by a lever in the cockpit actuating hydraulic doors. Even with precision flying and a quick on-off of the release system, you're looking at something like a metric tonne of water falling as a unit onto a structure already weakened by fire. To keep it from spreading over a large area, you'd have to fly very low, which is impractical and unsafe in these conditions. But if you did drop it from a low altitude, it would fall mostly as a mass, rather than dispersing into a mist of droplets, and you'd get a huge hit of water on the order of a tonne or more hitting the building more or less at once. Awards are given for effort- not the other way around. If so, who has the files? Having toured the production factory of these aircraft, been shown the function of the water collection and release systems, and observed their airborne operation, I can say with confidence that they are neither computer-controlled, nor able to release water in precise, fine amounts. By putting a misting system in it like they did for St Patrick's Cathedral in New York. Whether there was a misting system or a more conventional sprinkler; it appears that the fire started above where they would be (roof); meaning they wouldn't be able to do much. Wrong. They're designed for a force dump of water. Discharging a solid column of water (not a spray) means less water evaporates on its descent plus it delivers more impact force. Large fixed-wing airtankers have complex, computer controlled retardant dispersal systems capable of both precise incremental drops and long trailing drops one-fourth of a mile or more in length. Retardant flow rates can also be controlled to vary the retardant coverage level dispersed as required by the intensity of the fire behavior and vegetative fuel type. Where 'precise' means "less that a fourth of a mile" (1300 feet, for a cathedral whose long dimension is 420 feet), and 'incremental' means 'part of the load first, then another part of the load' - fractions of 6.3 tonnes, in the case of the CL-415 France mainly uses. "Precision air drops" on a small wildfire are very different from hitting a specific building in the middle of a city. Some aircraft may have computer-controlled actuation of water or retardant release systems. To the best of my knowledge, the aircraft used in France do not. Obviously, what's needed is smart water. This may be prematurely optimistic. My parents had a small kitchen fire when I was in 7th grade. Smoke damage on everything. It penetrated our kitchen cabinets and countertops. Even the appliance finishes had baked in soot. We spent days cleaning and the baked in soot was impossible to clean. Kitchen was almost a gut job. Down the hall, in the den the floor tile had soot baked in. My mom put in carpet. Getting rid of the soot smell was another almost impossible job. We used several coats of Kilz on the sheetrock trying to cover the soot. Last edited by aceplace57; 04-15-2019 at 09:06 PM. This may be prematurely optimistic. My parents had a small kitchen fire when I was in 7th grade. Smoke damage on everything. It penetrated our kitchen cabinets and countertops. Even the appliance finishes had baked in soot. We spent days cleaning and the baked in soot was impossible to clean. Last edited by aceplace57; 04-15-2019 at 09:15 PM. Yes, and???? load the plane with the amount you want to drop. Look at the first 2 passes in this video. The same precise drop by both planes. Given today's WAAS enabled GPS systems it puts an airplane plus or minus a couple of feet. The Cathedral sat on an island surrounded by water. Even if they don't they still have a guidance system that gives them precise control of altitude and flight path and that controls the spread pattern. The advantage of Notre Dame is that it sits on an island. you can either watch it burn uncontrolled for 5 hours from a distance like the fire fighters did or drop water on it from above. For purposes of art and history, it really doesn't matter whether an individual, or even a majority of individuals, dislikes a particular style. I don't want to lose exemplars of styles that I dislike any more than I want to lose exemplars of styles that I like. It's not like it's a secret what happened. It's a smoldering shell. Last edited by raventhief; 04-15-2019 at 10:01 PM. I've never been to Al Aqsa mosque and know little about it other than its location. So, no, it doesn't have as much personal relevance to me as Notre Dame cathedral. I don't know why that should be a matter of eye rolling, however. Paris is more important to my personal life than Jerusalem is. I don't consider that to be a matter of pride or shame. Which is why it is almost certainly not insured. This thread, and these particular comments make me think of a poem by the late great British comedian Spike Milligan. Or the lid has come off hell. Shall I ring the fire brigade? Or should I trust the Lord? I don't think we're insured! 'What's this then?' said the fire chief. 'Is this church C of E? How do they know "the amount they want to drop", given that dumping large amounts of water on the building could have caused the whole structure to collapse, which by the way is why they didn't do it? Although the French are not surprisingly appalled at the destruction caused by the fire, I'm pretty sure that they prefer to have the cathedral a "smoldering shell" than collapsed in a heap of wet rubble. Last edited by aceplace57; 04-15-2019 at 11:01 PM. Magiver, you seem to be very invested in being right about this. Would it make any difference to you to know that every single professional firefighter interviewed for this story on the various news stations said that using an airplane to drop water on the cathedral was not just unfeasible, it would have resulted in catastrophic damage to the cathedral, the surrounding buildings, and the people on the ground? What could it have been due to? Ashtray? Tightly coiled power cable? Heater? It’s a construction site. Anyone of two dozen things can cause it. While precautions are supposed to be taken, people get lazy. And or unlucky. The initial fire seems to have been concentrated on the scaffolding. The wooden frame is more or less gone. Engineers will need to examine it once it cools, stone cooling and contracting (after expanding) will put incredible stresses on the structure, equivalent of God knows how many freeze, thaw, heat, cool cycles. Very likely damaged beyond economical repair. It’s stature means the “economical” bit will be mostly ignored. Because you can calculate the dispersion rate at different heights and thus the loads created. By limiting the amount carried you can control the length of the release. If you looked at the link I posted you would see a very precise release repeated seconds later by the next plane. I heard about the al-Aqsa mosque a few hours ago. I was very happy to learn that the damage had been minimal. It is the third holiest site in the Muslim world, it is very old, and it is very beautiful. Losing it would have been a cultural tragedy, as losing Notre Dame would be. Luckily, while the damage to Notre Dame is far worse than that at al-Aqsa, it seems that both buildings will survive and Notre Dame will be restored. I think you need to check your theory. The people who know this business don't agree with you anymore than the people here do. Last edited by Magiver; 04-15-2019 at 11:58 PM. "The fire broke out in the guard's room outside the roof of the Marwani prayer room, Antar al-Hazmawi, a guard of the al-Aqsa mosque confirmed to the The New Arab. The fire brigade of the Islamic Waqf department in Jerusalem managed to control the blaze, while the area is currently closed to examine the cause of the fire, which is currently unclear." When the Dome of the Rock, which is how many people here probably first think of that particular mosque, suffers that kind of damage, I will lower my head in along with you in remorse. Edit: Remorse is probably wrong. I didn't start the fire, after all. Call it sadness and grief instead. Last edited by Gray Ghost; 04-16-2019 at 12:07 AM. Because you can calculate the dispersion rate at different heights and thus the loads created. And how do you know how great a load of water is safe to drop? What you've got there is a centuries-old stone building that has probably never been modeled (much less tested) for withstanding that kind of massive impact, currently undergoing unprecedented structural strains due to a catastrophic fire. All you've got for estimating an appropriate load is guesswork. And if you guess wrong and drop too much water, congratulations, you've just collapsed Notre Dame. Why on earth would you think that your idea is a more sensible way to approach the problem than "let's fight the fire as best we can without knocking the building flat"? Ultimately, I'm questioning who made the decision and what were the calculations used. "Nuh uh, water's heavy" is not a calculation. "Sure, stone buildings are plenty strong!" is not a calculation either. In the case of a medieval building whose original structure and construction aren't fully known even now, and which is being weakened every minute by a devastating fire in ways that you don't have the luxury of observing and modeling in detail, why should anyone naively assume that "calculations" are guaranteed to provide a reliable answer? The math and physics involved in these calculations are many magnitudes less than what went into designing the plane itself. I think you have no idea what would actually be involved in the calculations of how much water it's safe to dump on a burning Notre Dame from a plane without knocking the whole building down, nor how imperfectly known the data are that would be required to even attempt such calculations. Here's a video of the same plane discussed putting out a truck fire on a highway. A very precise strike. That could have been Notre Dame. Last edited by Kimstu; 04-16-2019 at 12:14 AM. And how do you know how great a load of water is safe to drop? Last edited by Magiver; 04-16-2019 at 12:25 AM. I'm sure the building and grounds are insured. Right. Because that's the main concern. Old buildings are great to look at, but modern fire codes exist for a reason. Apparently someone has faked a video supposedly depicting Muslims celebrating at the scene. I took a look at a RWNJ message board that I follow (but do not post on) from time to time. They're all convinced that the fire was caused by Muslim terrorists. 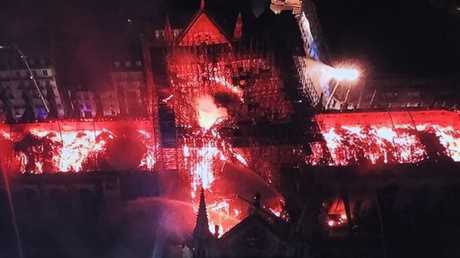 A few have gone a little farther, and stated that the fire was caused (by Muslim terrorists, naturally) in order to destroy a Christian landmark, so Muslims could build a mosque on the site. Combine this with (in the same thread I looked at) "This is what open borders gets you," and "President Trump is right; the French have no clue how to fight this, water bombers are needed," and of course, "This won't happen in America, as long as we can keep the Muslims out." Last edited by Spoons; 04-16-2019 at 12:57 AM. The problem is with the spire. It was added on in the 19th century and creates a chimney in the center of the structure. If it catches fire it becomes a heat engine and draws air up through the interior roof which is literally a forest of trees. Ultimately, I'm questioning who made the decision and what were the calculations used. "Nuh uh, water's heavy" is not a calculation. Here's a video of the same plane discussed putting out a truck fire on a highway. A very precise strike. That could have been Notre Dame. IF Notre Dame de Paris were a smoldering truck in the middle of a highway, I would agree. That method would have worked. A wall of water of that mass and force could have caused serious damage to the stone walls. Multiple professional engineering types have been saying such on TV for hours.